I’m pretty sure that was the coolest line I have ever skied. 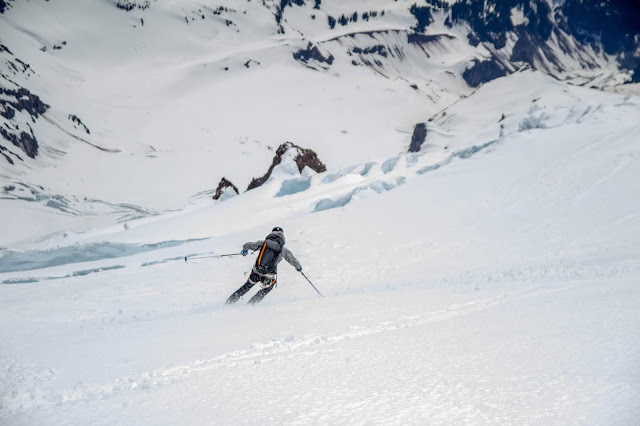 3,000’ of skiing high on the Upper Nisqually with challenging snow in high consequence terrain then another 2,000’ of steep and smooth corn down the Finger with 4,000’ of chill skiing to round it out. It doesn't get much better than than, unless of course you ski the Finger earlier in the season and take it all the way down the Nisqually to the bridge. Josiah and I left Seattle as the sun rose. The drive to Paradise was a confusing tour of the suburbs, as usual. We got to Paradise a bit before 8am and had no trouble at all getting a permit. We chilled out in the parking lot for a while, eating an early lunch and staring up at the Finger. We left the parking lot a bit after 9am and skinned through the forest to join the hordes headed up to Camp Muir. Josiah couldn't handle the heat and stripped down to his underwear. I would have as well if I hadn't gotten a heinous sunburn doing two laps on Muir without sunscreen last week. We broke off at Glacier Vista and skied an icy traverse down to the Nisqually then roped up and headed across the glacier on a nice skin track. The Fan looked like a funnel of death, as expected, so we headed towards the wide gully at 7,000' instead. We climbed up the gully to gain the bench at the bottom of the Wilson. Instead of continuing straight up the Wilson on a steep slope with cornices looming above, we traversed west to gain a ridge. This line took significantly longer, but I'm glad we took it because the next day a skier coming down from the Finger before us triggered a football field sized wet slide on the direct line. We skinned along the ridge and made it to The Castle at 1:45pm. We were the first party to reach camp so we got a choice spot with high rock walls and a large boulder to block most of the wind. I made water while Josiah pitched his 1982 Early Winters tent. It weighs just 4.5lbs and feels like a palace for 2. 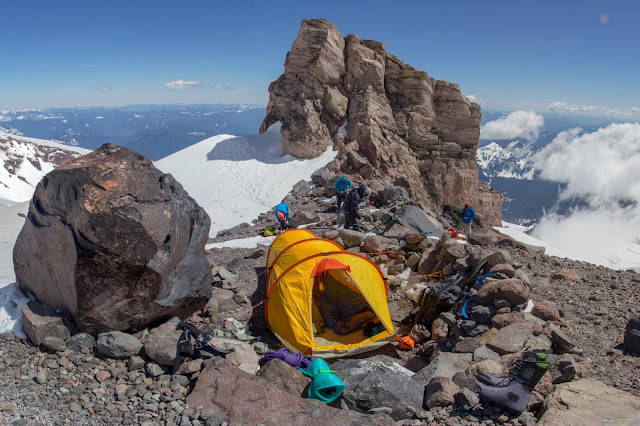 Much better than any modern single-wall 4-season tent I have used. We chilled out around camp for a while and enjoyed the beautiful weather. Life is so much easier in the spring when you can ski in the morning and then have all afternoon to dry gear and chill in the sun. Sure beats being tent-bound for 15 hours of darkness in early winter. We started trying to sleep at around 8pm, planning for a leisurely 4am wakeup. The winds really started to rip through around sunset. I would estimate gusts up to 35mph, but it's hard to say. They were strong enough that I was glad to be in a real tent instead of the Megalight. When we woke up at 4am, all the other parties had already left, and we could see the first party halfway up the Finger. 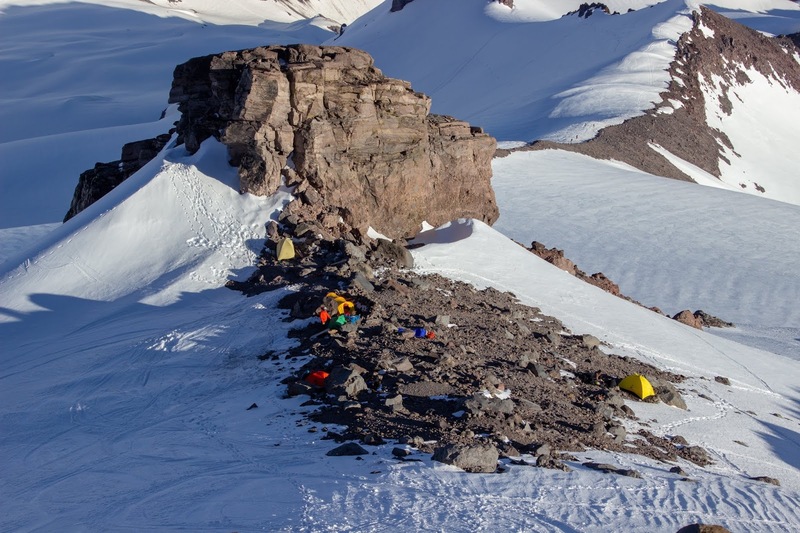 We left camp at 4:45am and skinned across the Wilson Glacier roped up with ski crampons. Conditions were too icy to bother trying to skin up the Finger, so we switched to crampons and started booting up. I used a ski pole and a whippet and didn’t need an ice axe. There was a good amount of rock and ice coming down from the parties above, so we picked up the pace and caught up to the first party at the top of the Finger. We took a small break to rope up for the Upper Nisqually then traversed through a slightly broken section to the middle of the glacier. We took over the lead and enjoyed some fun climbing on steep sastrugi that felt like a natural staircase. I was having a blast route finding and breaking trail on the upper mountain. It felt like exactly what I wanted. Not just a hike like the DC. If anything, it was too easy. My hubris soon got the better of me. I started feeling the altitude on the last 1,000’ to the summit. The climbing was no longer interesting, it was just a slog up low-angle snow to the summit crater. My pace slowed significantly, but we still stayed ahead of the other parties. I took a break to eat but it didn’t make me feel any better. I continued upwards taking a direct line to the summit crater. The winds became really strong as we neared the crater rim, enough to make walking forwards difficult during a gust. The views from the summit were better than I remember, with clear views of Stuart, the Enchantments, and Glacier Peak. I brought my camera but didn't care enough to dig it out of my pack. I admire Josiah for finding the will to take photos in situations like this. I definitely appreciate having his photos and regret not taking some myself. 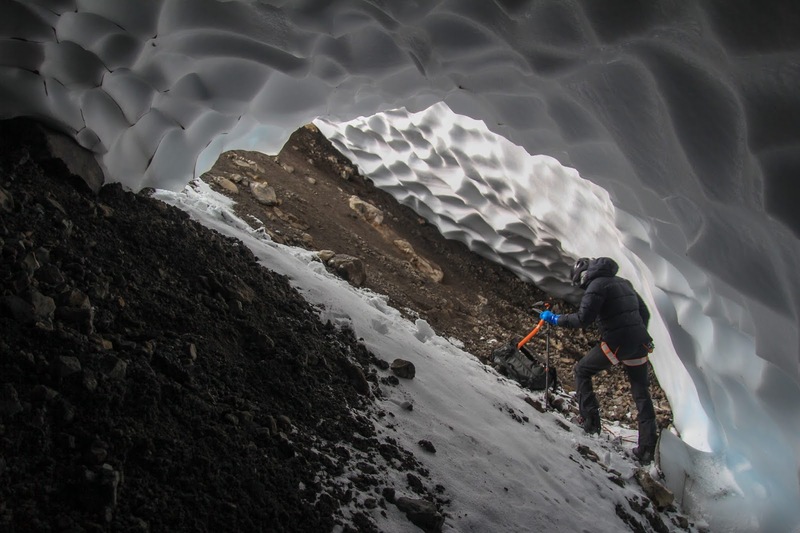 The winds were still quite strong and we thought the snow could use a bit more time to soften, so we decided to take shelter in the caves under the summit ice cap. I was definitely feeling the altitude at this point. I tried to eat some food but felt to nauseous to get anything down. I drank the last of my water and laid down for a while. When I climbed back out of the cave I found that the rope I had left at the entrance was gone. I walked over to the summit and found the guy who had taken it. 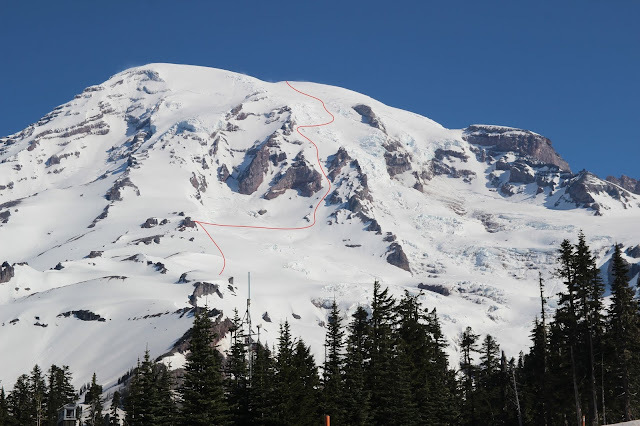 It's on me for leaving the rope there, but why would you take a rope from the summit of Rainier? We skied across the summit crater the same way we had come up. The upper mountain was mostly sastrugi with sections of edgeable névé. As we descended the Upper Nisqually navigation became a bit harder. 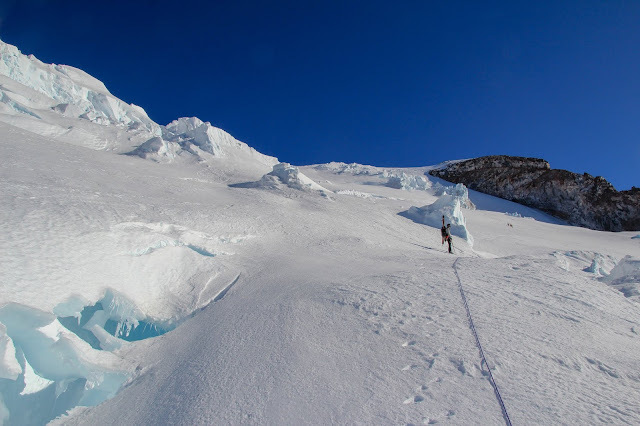 It was difficult to find our up track and the crevasses were sometimes difficult to see from above. 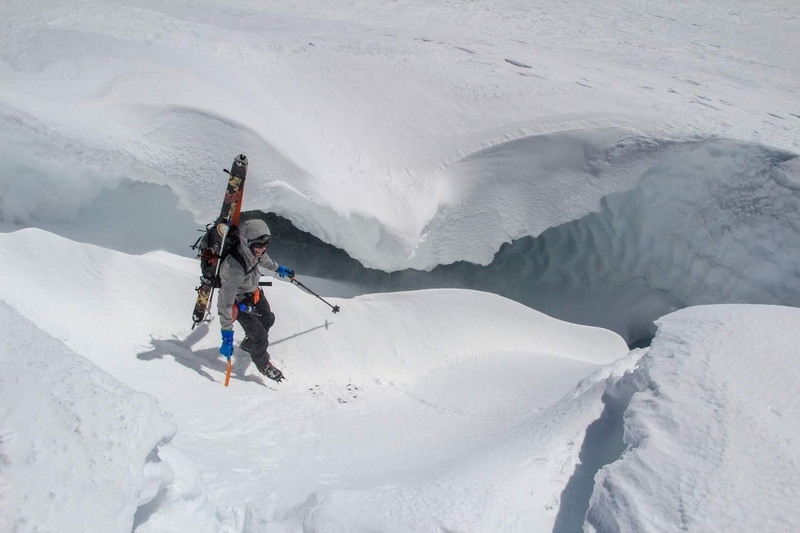 The skiing was easy, but the crevasse hazard and difficult snow conditions made it engaging. I got into a really focused headspace and enjoyed making turns with precision and control. Once we made it off the Nisqually the skiing got less serious and more fun. The snow in the Finger was slightly overcooked, but not to the point of being grabby. Honestly I think it was just about perfect. 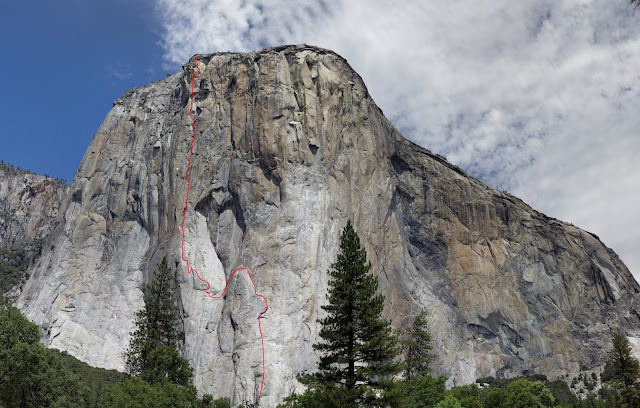 I ripped a pitch down to the top of the Finger then did another pitch to the dogleg below the false couloir. From here it was a leg-burning pitch out the bottom of the Finger and across the Wilson. So good. I really can’t think of another run with such a consistently steep grade, smooth snow, and epic position. It’s gotta be the raddest line I have ever skied. We continued across the Wilson to camp and packed up. I dry heaved a bit but couldn’t quite puke. We skied mush and wet slide debris down the Wilson. The Lower Nisqually was wet and grabby but there was a packed out track which made it go by quickly. When we made it to the base of the final 200’ climb up to Glacier Vista I puked my guts out. I was surprised, because I've never had a response to altitude like that, even at over 20,000' on Chimborazo. We skinned up to Glacier Vista, made our final transition, and skied over to the climbing center to check out. We enjoyed a leisurely walk back to the car through the Sunday crowds of hikers and sledders Paradise. Back at the car we took a while to pack up and admire the line. It really changed the way I look at Rainier. There are so many lines out there that I had just never thought about skiing. The Fuhrer Thumb, Kautz Glacier, Wilson Headwall, and the Gibraltar Chute all look incredible, and that's just the South side of the mountain. 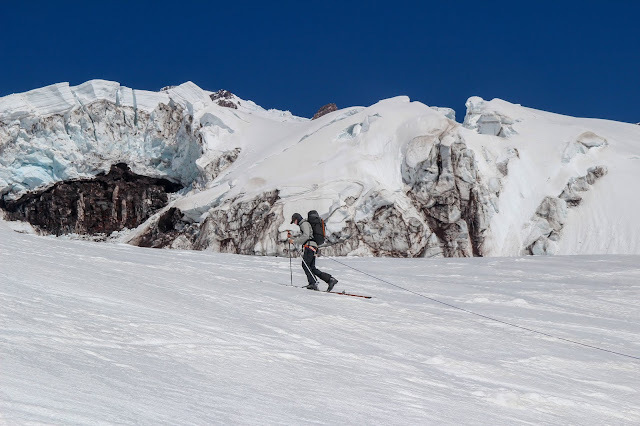 I don't know if I will bother skiing to the summit again any time soon, but there is something special about skiing the Upper Nisqually before it crashes down the mountain as the Nisqually Icefall. It really is an incredible line.